This is a special month in more ways than one. Firstly, it is the month when spring begins. When I was growing up I was told that my birthday (21st March) was the first day of spring. However, things have changed and the astronomical day of spring is widely used (20th March.) The second thing about March is that the light comes back with a flourish at the end of the month when we put our clocks forward by one hour. Thirdly, and of most note in the Dalamory household, is that March for many years has been celebrated as my Birthday Month. That means as many treats as I can dream up, the more innovative the better. 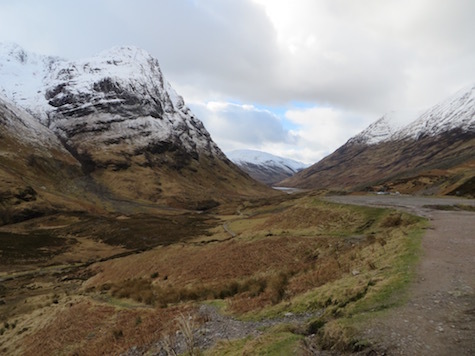 The pressure is on year by year to think of special, but inexpensive treats, often outings like the one above – to Glencoe. It is just a taster as it happened at the end of February but it shows you the type of outing that I thoroughly enjoy. Retail therapy to include new trousers and a neutral shade of body warmer. Visiting craft shops to find a replacement set of wind chimes to replace the one that has been blown to bits in a hooley. A weekend away to stay with friends, to include lunch out somewhere nice. A Chinese takeaway – see above. A new pair of dangly earrings. Clearing out the garage. Yes – that would be a treat. But I might just direct operations. Perhaps that is enough for now, after all there does need to be room left for spontaneity. And just to start me off, here is another photo from the lochan near Glencoe village. March Blessings from Dalamory . . . . . . . . 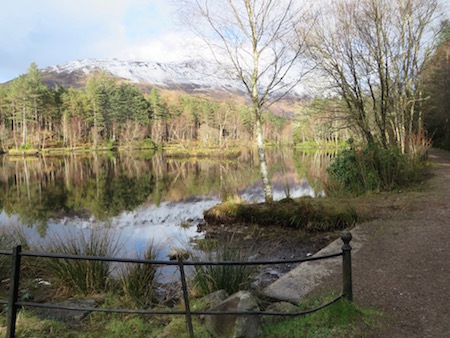 This entry was posted in Blog and tagged Birthday Month, birthdays, Glencoe, mountains, peace, treats, walking. Bookmark the permalink. Goodness, you live in a lovely part of the world. Such anticipation for spring along with a birthday month. How perfect. Love the birthday month. Enjoy! 1/Read whatever you want, no matter how silly. 2/Try coloring. amy son saw my canister of colored pens and said…ehat do you do with those? I told him ‘color.” He syas where and I showed him my coloring books. 3/Rent a good movie or TV series and watch it.